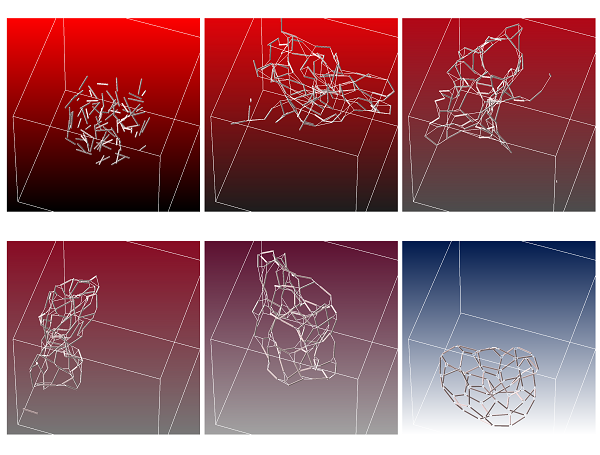 In this paper we explore a new paradigm for modeling geometric structures through self-assembly. This approach is inspired by the new emerging field of nano-technologies. At the very small nano-scales the laws of physics are different from the ones at the scales we are used to in daily life. Gravity is negligible and Brownian motion induced by heat is a crucial factor. In fact the latter provides the vital force that drives the process of creating new shapes at nano-scales: heat induced noise makes it possible for programmed DNA chains with free bonds to form and create shapes by bonding with other strands. The key challenge is how to program the DNA strands to create specific shapes. In this paper we introduce some concepts of this exciting new area of research and describe a couple of concrete self-assembly modeling examples. The goal of this paper really is two-fold: (1) to show an illustration of self-assembly at work in an appealing way using computer graphics and (2) to bring this exciting field to the attention of researchers in other fields.